Editing: Editing continued to be disjointed in recent days but with good and enjoyable reason; spending time with a grey nomad couple from Western Australia. The woman has a long-ago connection with my husband’s younger sister who is still in Northern Ireland. Unsurprising that there were gaps and confusions with decades-old memories, but entirely expected that there was a lot of laughter. The Irish are like that. And although cold, the weather held good with sunny days for their visit. 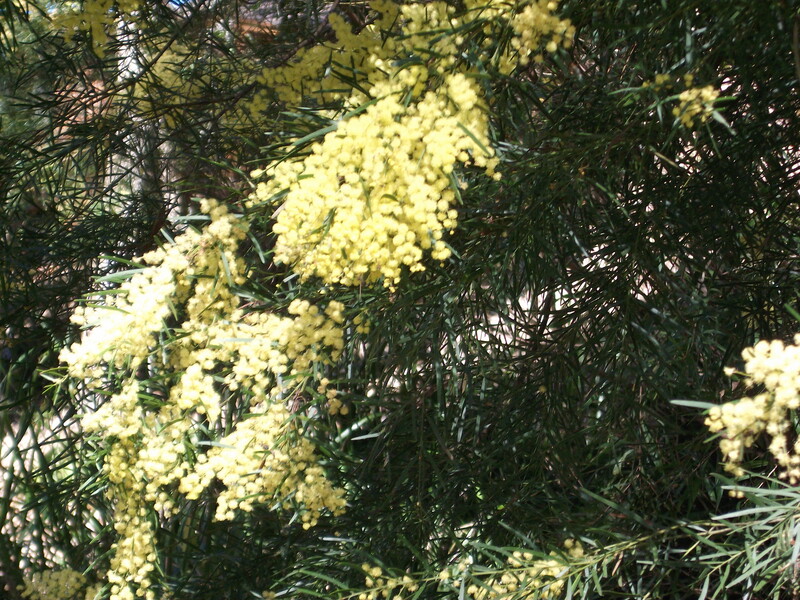 A walk in the park reminded that it is wattle time; not so good for hay-fever sufferers but bright and magnificent and uplifting for others. 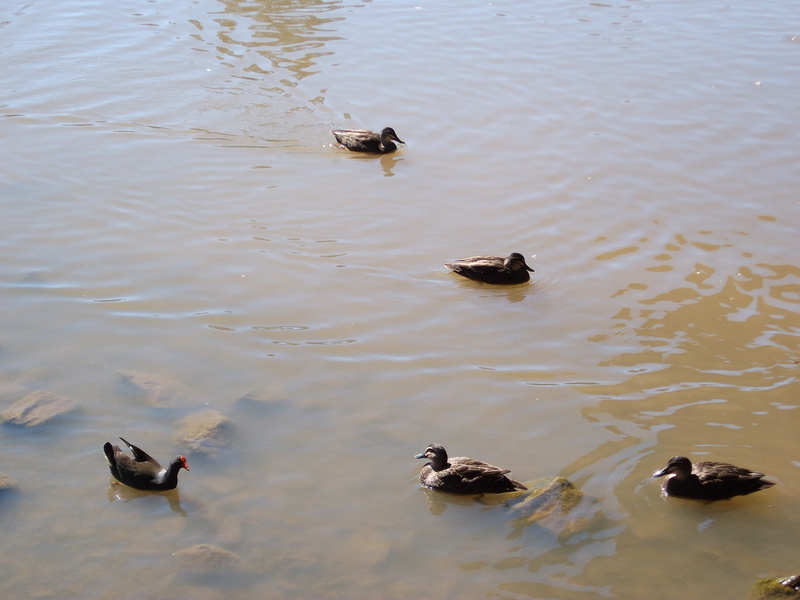 The ducks were enjoying themselves. Even so some chapters did get revised. No reading though. June 1997 – Arif: Freya hung on to the arms of her seat tightly, white-knuckled, as the Mission Aviation Fellowship plane circled the area and flew into the rough landing strip in a spiral. Now there was a problem with this aircraft. Her placement was doomed before it could start. She should have read the signs. She wasn’t meant to do this. All those hindrances and delays over recent months had surely been pointing that way. On the ground, four passengers melted through the crowd that was clamouring around the unloading efforts, to board vehicles waiting on the edge of the packed-dirt tarmac. Two guards edged the swarm back as a line of workers broke into a clearly familiar pattern of passing the large packages from plane to ready hands, to other hands, until till they reached a waiting United Nations truck. Within minutes Freya realised the scrawny starving people in the periphery weren’t here for distribution as she’d assumed. The packages were destined for storage first. Freya struggled to keep her expression neutral at this first evidence of the reality that starvation and malnutrition were the highest priorities in the area. Desperate people scrabbled along the edge of the transit line for pickings. Oblivious of injury risk, children of all sizes crawled between the legs of the workers to retrieve a few grains of rice or corn or a packet of therapeutic biscuits that might fall from a damaged container. Hunger is a powerful driver. The workers were thin but seemed healthy and strong enough. They had work; they had money; they must be able to get some food. It wasn’t like that for those on the fringes, the scarecrows. She saw two women faint; their ribs barely covered by skin. They were almost trampled until dragged beyond the throng to be cared for by family members who fanned them with dusty branches wrenched from the sparse shrubs on the boundary of the air strip. As there was no sign of an MSF logo or anyone who might be looking for her, Freya remained in the wing-shade of the plane. Heat crushed in on her whole body. Overcome by a cascade of sneezes and coughs triggered by the swirls of fine dust thrown up by all the activity, her breaths became shallow and barely sustaining. She leaned against a wheel strut, and pulled the cotton scarf from her neck to hold it over her nose and mouth. Gramma haed a shock an’ twas a sair strouchle tae walk a straucht line. That is, Gramma had a paralytic stroke and found it a hard struggle to walk in a straight line. It took me some time to learn interpret speech like this, but in the end I was mainly successful. It was usually from older rural folk. I wonder how common usage is now. Tonight Billy Connolly has a double TV program Journey to the edge of the world, so I’m primed after thinking about old Scots chat today.